My students and I had the honor of having Kevin Mulhern read the book to us during library and all enjoyed it. Every child, teacher and librarian needs to have this book! The messages are relevant now and will be relevant when your children read this to their grandchildren. The messages are simple, yet need to be repeated. My students and I had the honor of having Kevin Mulhern read the book to us during library and all enjoyed it. It was the second to last day of school & about 83 degrees, but my K-2 students were still able to understand what this brilliant man read to them. There is no way a child will not love this book! Such a beautiful message in this book about the power of love, especially for kids that have to try extra hard to reach their goals. I hadn't read the book before purchasing it, but it turned out to be the perfect book for the little boy we bought it for. The pictures are bright and cheerful, too. And Kevin wrote a sweet note in the book for the little guy we bought it for, too. Loved it !! My grandson Cody thought it was the best book ever ,he's 5. I can't state it any clearer than if you have children, nephews, nieces, etc. buy this book. I have purchased and read countless children's books for my family, and Cody the Cloud is as good as it gets. The book is well written, has a strong message that every child needs to hear, the artwork is topnotch and the quality overall is top-notch. The next holiday, birthday party or online shopping trip, pick up a copy or two and share with children in your family. Author Kevin Mulhern has had a very successful career in the entertainment industry and now he takes his talents to a whole new level! I consider “Cody the Cloud” the perfect children’s book, and it deserves to join the classics. I wish this magnificent little book was around when I was growing up. As a physician, I spend a great deal of reviewing books prior to placing them in my waiting room. This year, out of nearly 50 books and publications, “Cody the Cloud" has taken my office by storm. A magical combination of author and artist, the story and illustrations are beautiful. It conveys an inspiring message to help children accept and include people who are different from themselves and to appreciate their self worth. I am so glad I added this book to our collection, and the parents and children in our waiting room agree. I love this book and its message so much, that I have already purchased several copies to give as gifts to my friends and family with children. 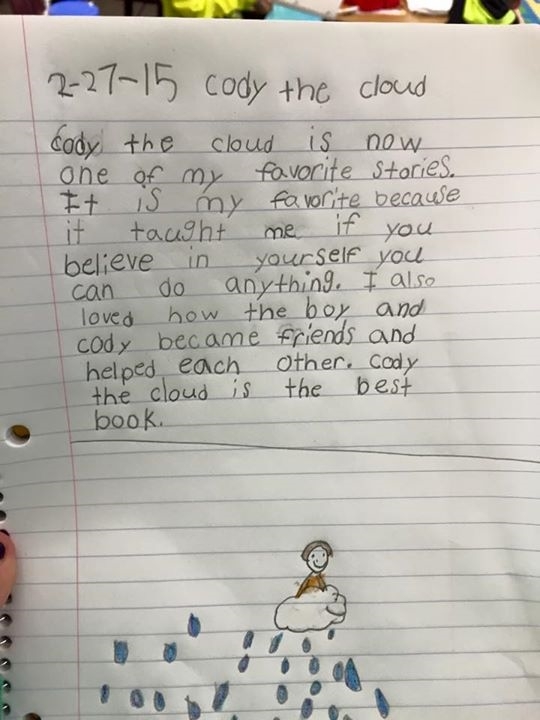 If "Cody the Cloud" doesn’t become a best seller, it's a crime. It’s a must read with a message that will resound with children of all ages. Composed by a talented author, I eagerly await Kevin Mulhern’s future works. He should write more, more, more! Kevin - thanks so very much for the fabulous book! Christopher loves it. The message is SOOO very much needed in this day and age. Better than any "New York Times" review. I received your book in the mail today! Just wanted to say thank you for the nice message you wrote to the boys. I read the book and it is wonderful! The message so important in today's society and the illustrations are fantastic! I encourage everyone to order one for your child, a friend or to simply donate it to a school or child care center. It is a wonderful story and beautifully illustrated. I know my two grandsons will enjoy it for years to come! I hope you write more!!! Thanks again! Loved it!! Such a sweet story with an important message. Very well done. I am a “celebrity” reader on the 28th (of February, 2015) at the Warwick Mall for NEARI Read Across America. Cody the Cloud will be the perfect book for my reading! So excited!! Congratulations to Kevin on a fantastic premiere book. As a father of three girls that are past the Cody the Cloud stage, I consider myself well-versed on kids' books and this one has the potential to be a classic. I've bought a few copies for nieces/nephews as I'm hoping to spread the word of a great book with an uplifting message and beautiful illustration. I highly recommend it. Watch out Dr. Seuss... A rhyming insipring story for the whole family! A beautifully whimsical story for the whole family! This book encourages us to be our best when we don't realize what are best is yet. Kids discover what it is to be a good friend and what the power of friendship can do for all of us. Bullying is such a terrible and long on-going problem for children, this inspiring story shows us that even the smallest guy, the one that gets teased, is important and that everyone is special. The message is on point. But most importantly "Cody the Cloud" is fun to read, as the author took the time to make the whole thing rhyme. It's a fun adventure that every child should get to enjoy! This is such a great book! The message behind this wonderful children's book is powerful...not only does it touch the topic of bullying but it also teaches to love who you are...even if you're not the biggest or the strongest! I am a toddler teacher and have read this story to my students, several times. Even though it's geared for older children, my class loves to hear about Cody and his friend. The pictures are fun, bright, and colorful, so there's lots to talk about! I definitely suggest this easy read for your child! It's also a great gift idea! I plan to buy this book for upcoming birthdays!! My students love this book. It has a wonderful message. The author has intertwined a great message with an entertaining story. This life lesson is for young people to learn and for older people to re-learn. The ease of the read along with great illustrations make this children's book a home run. Buy it and see for yourself. No child's bookshelf is complete without this story and it's sweet illustrations. Cody the Cloud is a delightful find for anyone who loves reading to children. The friendship between Cody and the friend he finds when they need each other most symbolizes the power of true friendship, and how just one person believing in us can be the magic that helps us achieve things we didn't believe were possible. This message is delivered in a rhythmic and poetic style that sounds lovely when read aloud. No child's bookshelf is complete without this story and it's sweet illustrations. Absolutely delightful book with a wonderful message.With today's society and bullying at an all time high "Cody the Cloud" is a necessary read for young children and it is fun and sweet all at the same time! Just got my copy and I just love it! What a great inspirational story and the colors and illustrations are beautiful! Thank you Kevin for your commitment to bringing light on a very distressing subject for all children today. I just had a conversation recently with a woman who told me of her schools days being bullied. It still hurts her emotionally today. My hope is that Cody the Cloud would have an impact on young children so that they have compassion and understanding for others unconditionally. I loved reading this book and recommend it be placed on all the shelves of elementary school libraries. This is a charming, elegant, well-written book that you and your kids will love. For added effect, have your young one(s) read it aloud. Great life lessons delivered in entertaining fashion. Oh, and the author — who helped me out with a book of my own — is a real standup dude. Buy it! Please. Children of all ages will love this story! No matter how much you struggle in life, there are always brighter days ahead. Overcoming adversity, making new friends, if at first you don't succeed try, try, try again. Cody the clouds brilliant illustration brings this rhyming heart warming story, about adversity, to life. We love to listen to our 8 year old read it to us. Looking forward a series of Cody The Cloud stories. Bought it, read it, loved it. Can't wait to read it to my great grandchildren. I agree with all previous reviews and when I look at clouds I will always look for Cody. Me and my kids absolutely loved this book!! My 5 year old was cheering and clapping at the end!! I can't say enough great things about it! I highly recommend it!! It sends a great message to our children!!! This is a fabulous children’s book that has a Dr. Seuss feel to the writing style with a positive moral teaching lesson for children. My daughter and I loved this sweet story that no matter how small you are or how the people around you treat you, you can make a difference…you must just believe in yourself and surround yourself with positive, like mined people. This is a definite must buy! Absolutely love this book. It's on the TOP shelf next to llama llama.. The story is amazing and the kids love Cody. I can't wait to start giving this book as an add on baby shower gift!!!! A touching message with very inviting, colorful illustrations. A great addition to any child's book collection! Fantastic book to be shared with every school age child!